Would you like your clients to be loyal and refer you? Do you find it difficult to stand out from your competitors? Are you experiencing the headache of high staff turn-over? Are you frustrated with clients switching to lower priced competitors? Don’t wait until it’s too late and someone else builds loyalty with your clients! Now is the time to make lasting improvements within your business. Through the implementation of the 7-step process outlined in this book, you too can experience more repeat clients, improve revenue and create a client base that is happy to rave about you. Caroline has created and successfully implemented the 7-step method outlined throughout her career to achieve multimillion-dollar results and now she shares her simple yet profound insights. You too can achieve better results for your business and it’s easier than you think! Caroline is an experienced CEO with over 20 years of expertise spanning across the corporate and private industry. She has led small, medium and multinational companies, with annual revenues ranging from $1 million to more than $200 million. Caroline's childhood dream was to become a fighter pilot, but when that didn't materialise, she found her place in the corporate world, climbing the sales and marketing ladder to her first CEO role with Cox & Kings Australia. From there Caroline took the reins of Australia’s leading franchise network of professional builders, Hotondo Homes. This role saw her as a pioneer in the industry; as a female CEO leading a large franchise home building company. Caroline has built a reputation as one of Australia's foremost experts on business leadership. Whose work has been recognised with both awards and media coverage. Caroline has been recognised twice by the Telstra Business Women’s Awards for her achievements in business. Caroline has spent many years helping businesses grow, innovate and work through challenging situations. As well as being a published author, Caroline is an avid trend watcher. She regularly contributes to HuffingtonPost, Chamber of Commerce & Industry Queensland, Smallville.com.au to name a few on how to master and build a successful, thriving business. Passionate about entrepreneurship, especially about inspiring more women to step up, take a seat at the table and own it. Caroline witnessed how easy it was for corporate strategists to overlook their people. While figures tell a story, it is people that determine the success of a business, Caroline believes. 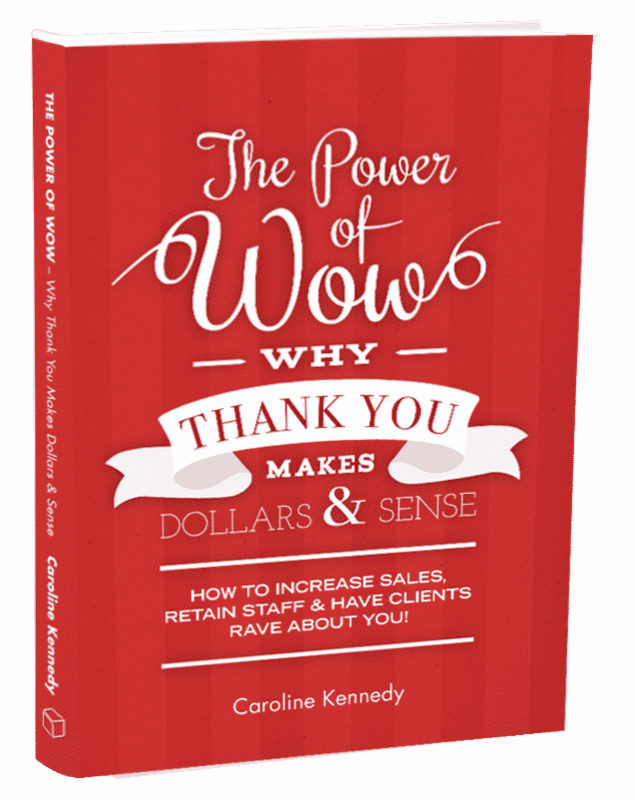 This prompted her to write the book, The Power of Wow! Why Thank You Makes Dollars & Sense, about developing lasting, engaging connections with staff and clients. "I believe that people want to do business with and work for companies that recognise and value them; there is a powerful intersection between building loyalty and recognising people." - Caroline Kennedy. "I started reading your book over the weekend and I must admit that I am thoroughly enjoying it and it's giving me some great insight and mentoring. It's a very easy book to read, very well constructed and informative. You should be incredibly proud of this book." "This book is practical and easy to follow with lots of good tools and examples to engage with customers and staff in the best way. The 7 steps outline a clear way of thinking and action plan for any business owner to implement. A great read!" "I found this book easy to read with helpful tools and lessons in improving customer and staff relationships. Really enjoyed the anecdotes and examples. Its been great for my role in which I am responsible for both staff and dealing with clients. It's given me new knowledge and confidence. You can't go wrong with this book."